i saw your introduction post! welcome to idb! thanks! I'll hopefully be around! I recall the last one I saw going around tumblr and I was awake in enough time for the second one though I was too busy to catch the watch party! see you then! that's honestly a good point lmao, i'm just a sucker for aesthetics! I'll keep my text normal sized! Our PINOF marathon is tomorrow! I'm nervous, I hope it goes well!! I was thinking that if rabb.it for some reason fails (this is me being wildly optimistic, but say there is a limit of people that can watch at the same time? Is there? But we probably won't have that many lol), maybe we could split up into two rooms. Is there anyone here that will be around for one/both of the watch parties and might want to act as a "backup host" if it's needed? Edit: just checked and each room can have up to 200 people. I really don't know what we can expect but most probably less than that. Like way less?? I have no clue. Reblogs and retweets are still welcome so more people join in! i'm here do you still need a back-up host? that was super fun !!!! i know were currently in the calm before the storm that is pinof but i just wamt to gather some suggestions for our next watch fest. i was thinking of giving it some time to simmer so if possible to suggest themes/videos until some time next week, then well do the votes after that. we havent been able to do one in a while. depending on peoples video suggestions, i was hoping we can do another showing on dec 16 so well possibly be able to squeeze another one on dec 30th too. if not, we can do the show on the 23th, just before the holidays start. We could maybe do some holiday themed videos, like festive ditl, the tree, maybe some of the more holiday themed gaming videos. I personally wouldn't mind if we did a mark of oxin themed fest either, and that's less time sensitive. Or maybe even a Phil's childhood games fest, like bubble bobble, bishi bashi, katamari etc... idk just tossing some ideas out. maybe some gamingmas vids? although it'd be hard to decide which ones as a group. christmas themed ones sound great! how about christmas baking, festive ditl, both charades videos, that crunchyroll spon that was uploaded on dapg (i think it was also for gamingmas? no?) and shelter !! not all are xmas themed, but it's just ones that i really like and remind me of the holidays. We could maybe do some holiday themed videos, like festive ditl, the tree, maybe some of the more holiday themed gaming videos. +1 to moody's idea! personally, i'm really in the mood for something festive and any excuse to watch the festive ditl! im still thinking of ideas for the watch party of the 30th! should we still do a festive theme and therefore watch gamingmas vids? or something else? Yes for festive vids! And also big HELL YEAH for the festive ditl. I'm up for gamingmas vids, personally i'd love to watch the first Who wants to be a millionaire which was the first gamingmas vid ever and it's the one that always reminds me of Christmas. Is everyone ok with just going with holiday themed videos on the 16th? If not, let me know! Otherwise, I'd say let's just go with that? The 23rd is too close to Christmas I think, people might be busy (some people, such as myself, celebrate on the 24th). - Do we go back to our old format, or do we use rabb.it and involve the phandom. It feels like we can't have both - people outside the forum just don't get how to or don't want to use forums?? - How many vids do we want to watch. Festive DITL is a must!, but what else? It would be nice if these videos work well together. Like @ame said, we still have some time to decide. Keep posting your video suggestions, we already have some great ones, and we can start voting soon. we could do festive dilt and the first who wants to be a millionaire, like @glitterintheair said because yeah it's christmassy and cute! these two videos are around 42 min. either we just keep these two or we try three vids? but that may be too long for some people! I loved chatting with everyone on rabb.it so I wouldn't mind doing that again, but I'm okay either way! I'll be making the polls in a few hours, so last chance to suggest festive videos for us to watch on Sunday, December 16th! I'd say the DITL is a must, but what else do you want to see? I will also make a poll regarding rabb.it and see what you all prefer for this watch fest. Okay, so I took your suggestions and added some of my own. This is for this Sunday, December 16th, 1 PM and 7 PM UTC. Please vote!! This poll is a bit different - you can vote for more than one video. We will watch the DITL, and either one more video if it's a long one, or we can do 2-3 shorter ones - if that's the case, we will pick the top ones that win. Also, please vote for which format to use in this watch fest - do you want the rabbit to come back or not? I would say that if we don't use rabb.it, we should probably keep the phandom involvement low. We got some interest with our pinof watch fest and those people didn't join the forum, so using our old format means it's just for us - which is great! It's all up to you! The question is, how many videos do we want to watch aside from the DITL? I'm okay with for example DITL + THE TREE + millionaires, which would be ~45 minutes. Is everyone okay with that? - As this wasn't included in the poll, should we do that on top of our videos? I think we can watch the remaining gamingmas videos on the 30th, unless we want something else. But this is for later. 2. I just realized something. After the time change, is the first showing still at a semi-acceptable time for people in, for example, Australia? Someone on twitter asked me to check what time it would be for them, and it turns out that 1 PM UTC is midnight Sydney time. Are there any people here for whom both the showings are either too late or too early? i know in canada (or at least the part where im from), we have already done that a while back already. ive always slept in for the first showing cz that happens around 5:00 am for me, but the next showing - which is at 11:00am - is a bit more manageable for me to wake up to on a day off. but thats just how ive worked it as. perhaps we can try to make the times between the two showings a bit longer? So since dnp dropped a huge bomb on us today (mostly a good bomb, I'm excited buuut still), I thought we could have a nostalgic watch fest on the 30th. 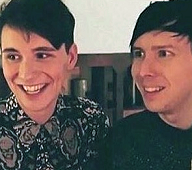 We did pinofs recently, so should we watch gaming channel content, maybe? What do you think? Or do you have other ideas?